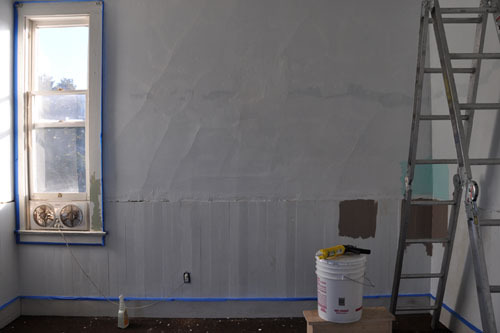 When last we left you, gentle readers, I'd spent an entire flipping afternoon doing more caulk around the back bedroom walls because priming had revealed cracks. 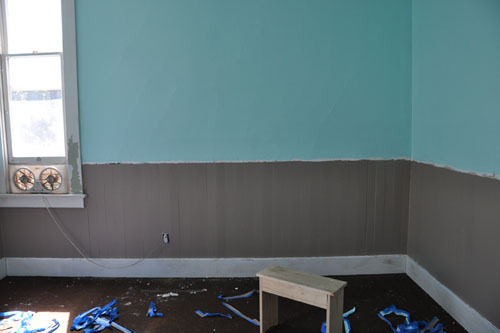 Then I spent another hour or two climbing up and down the ladder to tape off the trim and ceiling for painting. The plan was that Noel would come home from work and do some more priming, and when I got home from having ginger cosmos at a friend's house we would start painting. Only public transit did one of those burps it sometimes does and instead of Noel getting home at a reasonable hour, he'd just gotten in and was making himself some dinner when I got home. So we had a little discussion about how much priming was necessary, and eh, just decided to put the first coat of paint up. 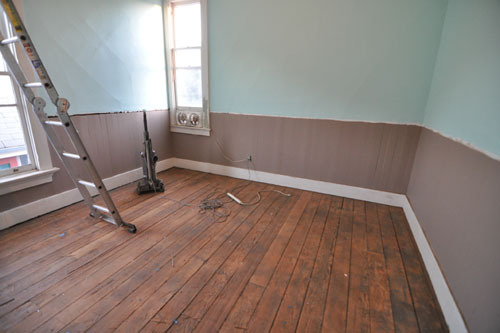 We had this theory that one coat might be enough, but in the light of day it was not quite, so we put on a second coat. 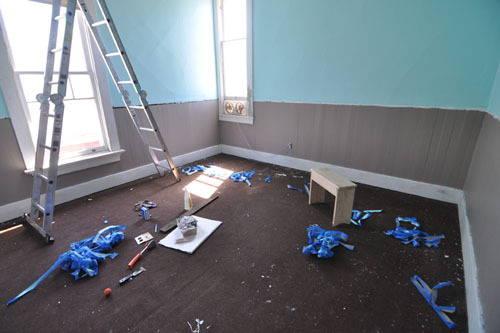 Then we pulled off the masking tape, and began cleaning up to do the floor. We picked up the trash and tools and then I rolled up the carpet. There is something truly unpleasant about old carpet. I am not a carpet fan at all, but the worst part is removing it and finding all that stuff underneath. Plus it's dusty; I'm still coughing from the experience. The floor looks... well, it looks GREAT in the photo, but it's not so great in person. 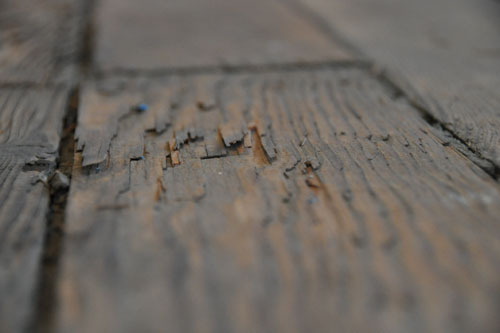 The real problem is that the wood is very splintery and brittle. Several sander plates got destroyed to get the floor that smooth. Fortunately, most of the really bad spots will be under the bed, and the one that won't we can hide under a rug. But every time people tell me that the wood floors in this house are terrific and original and wonderful, I think of moments like this. This stuff popped out of the gaps between the boards as we cleaned up. It's been in every room that has carpet. It's kind of crumbly and dirty. I'd love it if this was not just a hardened chunk of 130-year-old dead skin, dirt, and animal fur. Somebody please tell me this is some kind of quaint Victorian gap filler made from horse hair and tar or something equally appalling. I know it sounds weird, but I'd find that a lot easier to stomach than that this is just filth that has been falling through the carpet and collecting between the floor boards. Anyway, with the floor not in good condition and the deadline we set for stopping this project fast upon us, we'd decided that no matter what we would be moving the furniture back into this room today. We'll get to the trim pieces above the wainscoating soon enough, but we needed to stop working on this room for now. 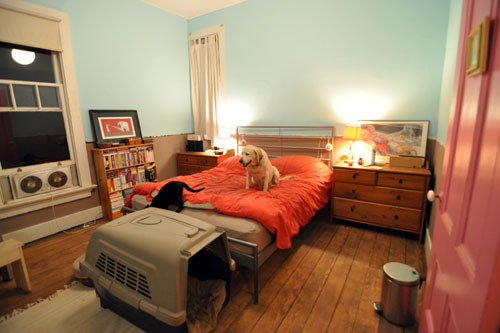 And a note about the new room, which feels ridiculously spacious and airy. We also took out and gave away a large dresser and several CD shelves (legacy from before we had all our CDs ripped to our house media server). It's so nice to have decluttered as well as doing the cleanup and painting in this room. that stuff probably is pretty much just what you guessed: jute (or hemp) plus tar. I also think maybe it is actually a gap filler. 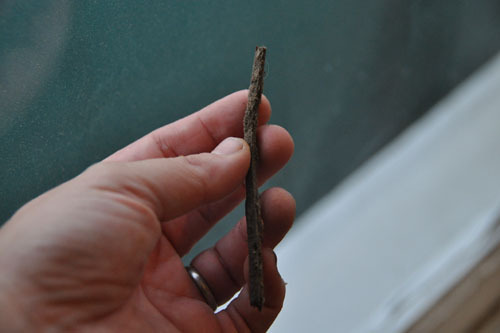 I've never seen wood splinter like that, though, I wonder what caused that and if it might be fixable some day. Did you chuck the old carpet out the window? My kids always enjoy helping with that job as we've renovated our upstairs bedrooms. As amusing as chucking a carpet out a second-story window would be, no. A) it would fall onto my plants, and B) none of the windows open enough to fit the carpet through. So we carried it downstairs. Noel had this brilliant idea about cutting it in half with the sawzall, but I vetoed that. 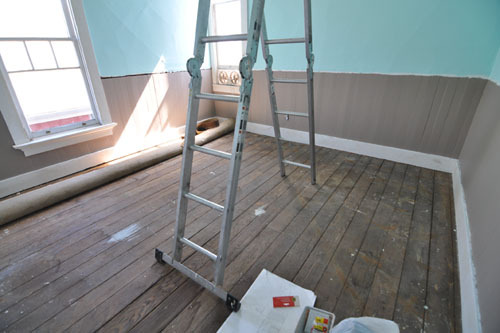 I've been reading this blog for quite some time and find it very informative and inspirational to would-be Victorian owners/restorers. One thing I do have to mention, though, is that uncharacteristically you've been spelling "wainscoting" wrong consistently--there is no "a" after the "o". That's my PSA for the day. Have a lovely rest of the weekend. L. Opine, thanks for the spelling pointer but actually both spellings are correct. Not that English has any correct or incorrect spellings, of course, she says putting on her linguist hat very briefly. Not to be off-topic or argumentative, but no dictionary I've checked accepts the wainscoating spelling--neither US nor UK. Lovely color combination, that blue and brown scheme. It's in the OED. Not that any dictionary tells you definitively whether a spelling is correct or not, since English is not a prescribed language. And thanks, I like the combination. Still not sure whether I want to go with a less green wall colour, but I'm going to live with it for a while. Dang I wanted you two to get into a linquist cat fight! I've always suspected that L.Opine is a Cunning Linquist! Wow, that room looks awesome now. I hope you do a quick before-after post, it's quite a transformation.